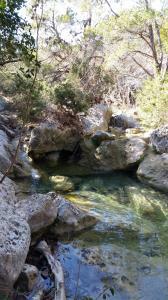 This was either along the Canyon Trail or Rock Trail portion of the trails. I was looking for a new place to hike and found this area. I didn't end up doing all of the trails, so I'll have to come back. I encountered several mountain bikers and a few other hikers/trail runners, but for most of the time I was alone. There are nice water features to take in (multiple small waterfalls) and good views. I began to go up the Mt. Lakeway trail (which connects to the Canyonlands trails), but turned around before I got all of the way up because I didn't know how long it would be and I was running out of water. I'll have to return with more water to do that whole trail and finish the parts of the Canyonland trail that I skipped! What I didn't like: You could hear (and in some places, see) construction work going on, building new neighborhoods on the sides of nearby hills, and near the start of the trail there is some kind of treatment facility that stinks up the area. But the trails are varied enough and interesting, so I still enjoyed myself.